When it comes to using up leftover bread, classic British baking is particularly brilliant. How often have you sat at your computer, wishing you could reach in and take even the tiniest taste of whatever baked treats lie in front of you? Of course the recipe is right there – you could most likely make them yourself – but there’s something about an original recipe baked by its creator and given with love that’s just that little bit more special. This recipe started life as something really rather different. Last night Carniverous Boyfriend and I headed South of the river to my parents’ house for our first BBQ of the year (woohoo!). After the glorious sunshine of last weekend the weather didn’t quite deliver, but it was definitely warm enough to be outside. Sipping a glass of cold prosecco as the smoky smell of chargilled meat filled the air, I started to feel like summer could be on its way. My Mum asked me to bring a pudding and, knowing my Dad had been put in charge of buying the meat, I decided to go for something light and summery to cleanse our palates after the protein onslaught. Platters of rare sirloin steak, garlicky chicken supreme and three different types of sausages later, a delicately creamy dessert proved exactly what the doctor ordered. 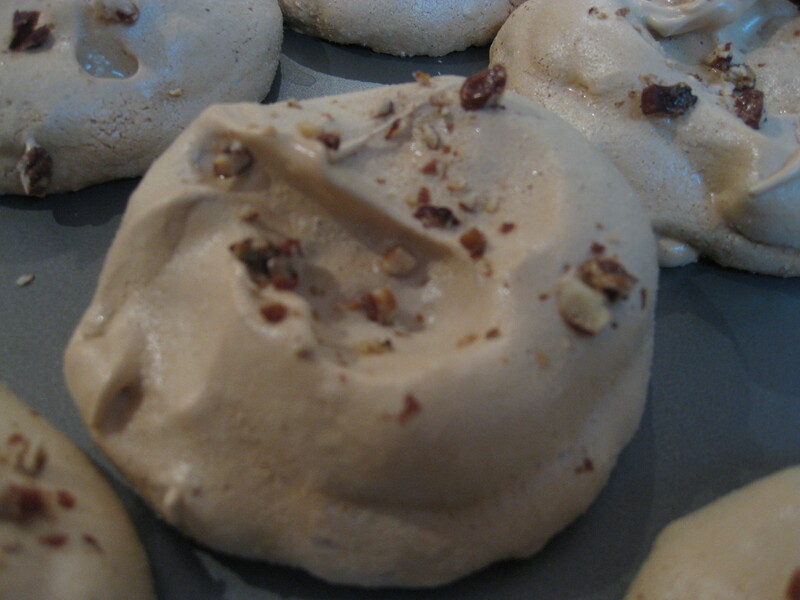 These praline meringues are crispy, delicious and so simple to make, the brown sugar and praline adding a delicious nutty crunch which works well against the smooth maple mousse. I opted to freeze my mousse for an extra contrast of textures, but I think it would work just as well without. 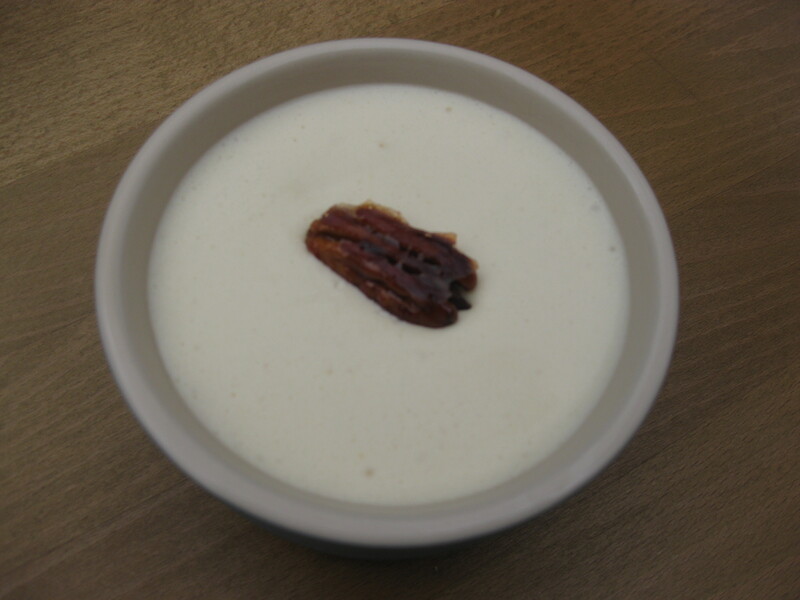 And if you’re feeling really lazy, you could forgo the mousse altogether and serve with a dollop of thick cream or Greek yoghurt, drizzling a little maple syrup over the top to finish. Preheat the oven to 180 degrees C. Line a baking tray with parchment. 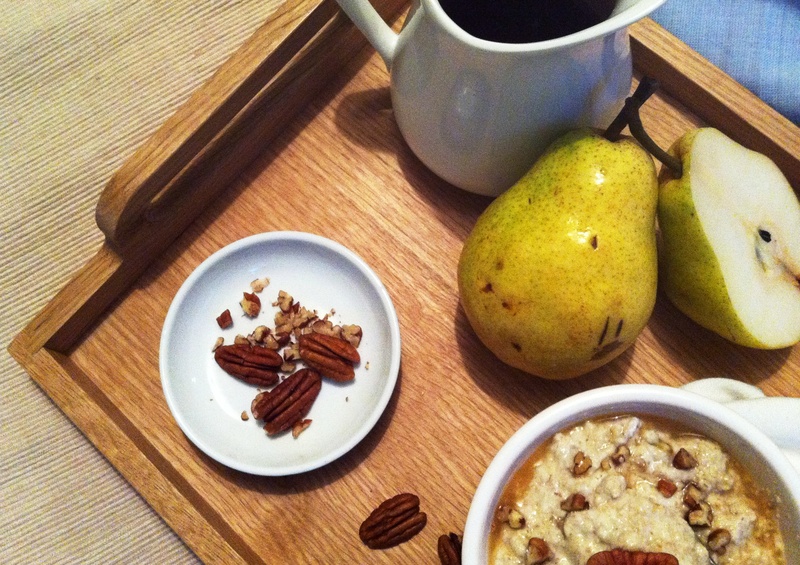 Mix the pecans and maple syrup together then spread on the tray and bake for 8-10 minutes until golden – the maple syrup will caramelize around the nuts, creating a delicious crunchy praline. Remove from the oven and cool on the tray. Chop the cool pecan praline roughly to a chunky crumb, leaving aside a few whole pecans to decorate later. Preheat the oven to 120 degrees C. Line a baking tray with parchment. Whisk the egg whites in a large bowl to a soft peak. Add the soft brown sugar and continue to whisk to form very firm peaks. Finally fold in the caster sugar and praline crumbs with a large metal spoon, leaving as much air in the meringue as possible. 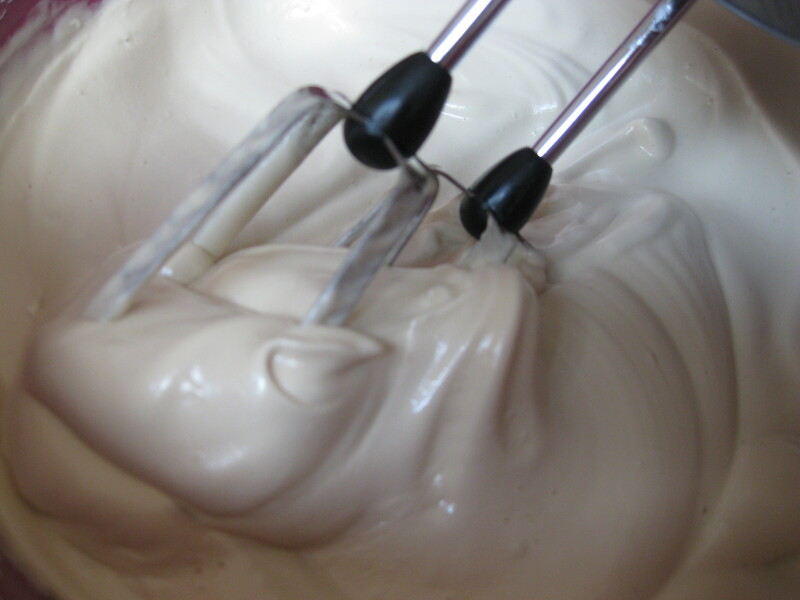 Spoon the meringue mixture onto the prepared baking tray. I used a dessert spoon to make nine even sized meringues, slightly spaced apart. You could vary this but remember you’ll need to adjust cooking times according to size. Cook for one hour at 120 degrees C, then reduce the oven temperature to 100 degrees C and cook for another hour. They should be hard when you tap the outside, and slightly golden. Remove from the oven and cool on the tray. Store in an airtight tin until you’re ready to assemble. Whisk the 3 egg yolks in a large heatproof bowl until thick and foamy. Warm the maple syrup over low heat until nearly boiling, then pour over the egg yolks and continue whisking over a bain marie until thick and creamy. Remove from heat and continue whisking until cold. Put in the fridge to chill further. Softly whip the cream and fold into the chilled egg yolk and syrup mixture. Put back in the fridge while you complete the final stage. Whip the egg whites to firm peaks with the pinch of sea salt. Fold in the chilled syrup, cream and egg yolk mixture then freeze. 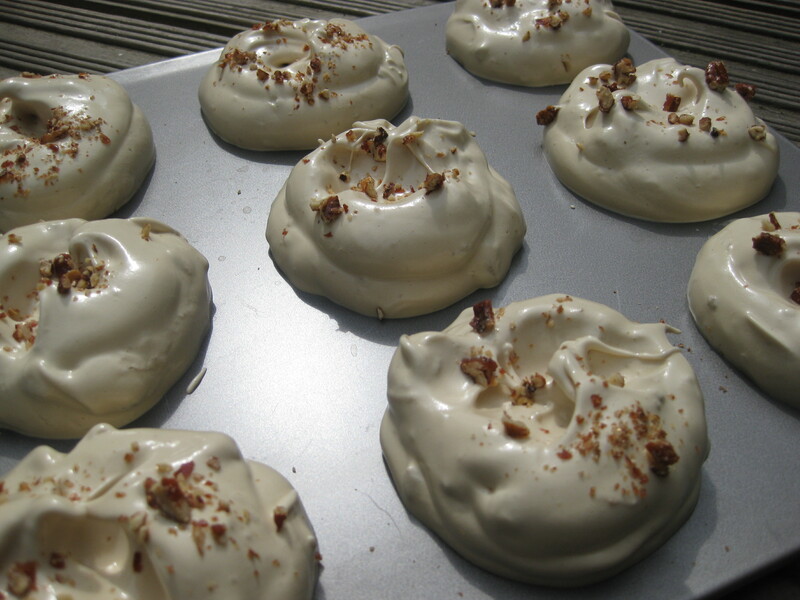 Put the meringue on a plate. 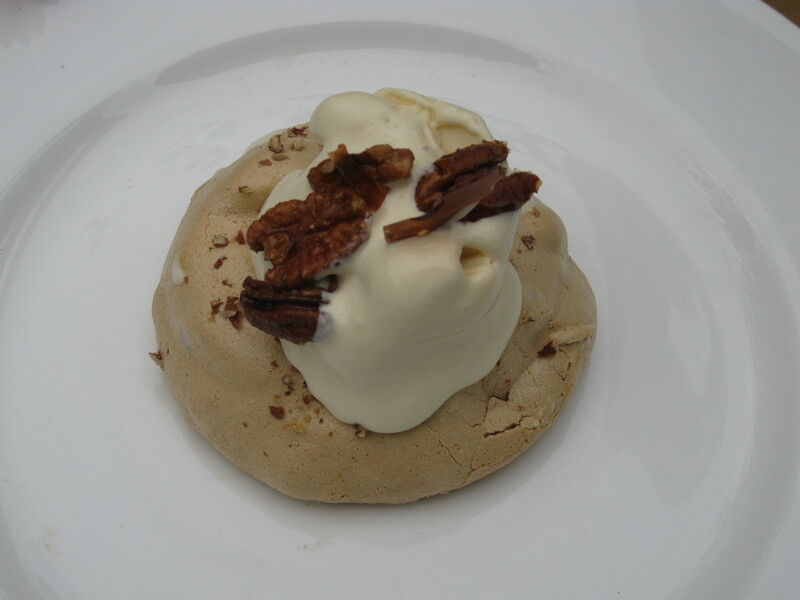 Using an ice cream scoop, place a large dollop of maple mousse on top. 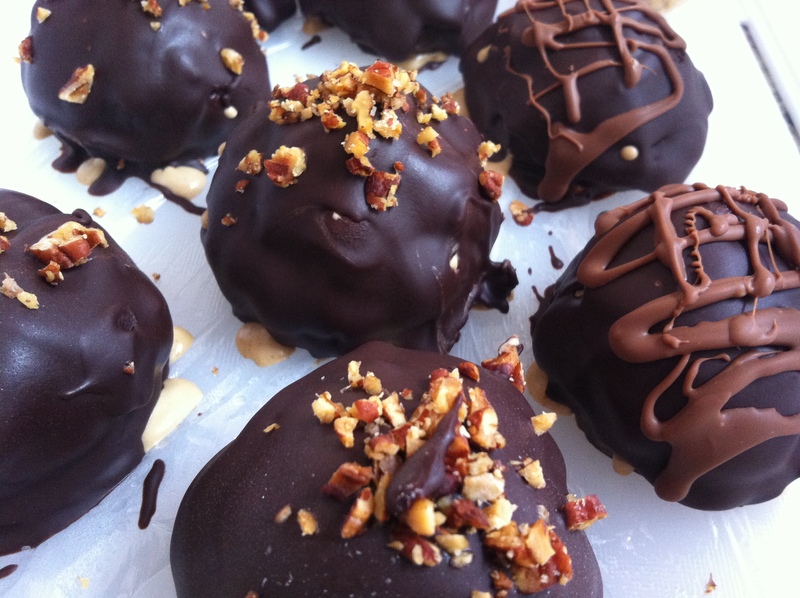 Decorate with remaining pralines. 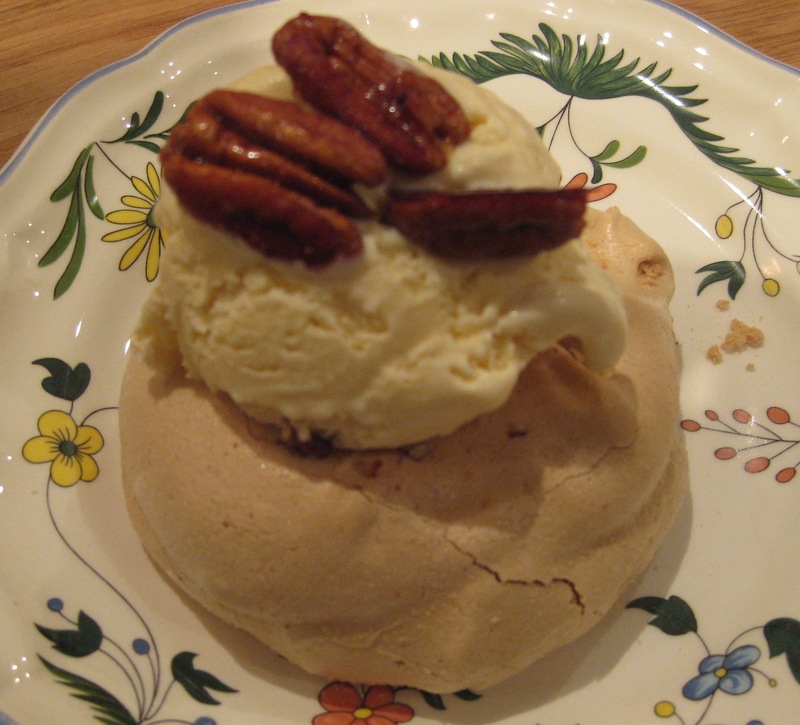 You could also make flatter meringues and stack in layers with the mousse for something bit fancier. And if you have any leftover mousse you can serve in little ramekins like the one below. Enjoy! A slice of gooey chocolate joy! We recently visited the Big Easy on the Kings Road for the first time. Self-styled as ‘deluxe crab-shack dining’ this local institution transports you to another time and place, serving up lip-smacking, rib-sticking dishes; the perfect spot if you want a buzzing atmosphere and a big feed. After polishing off platters of crab claws dripping in sweet drawn butter, smokey seafood, sticky ribs and piles of fries, our thoughts turned to dessert. Nine times out of ten I’ll choose a pudding based on its chocolate content, but if there’s pecan pie on the menu then the chocolate takes a back seat. It’s my ultimate indulgent Amercian pudding – nuggets of crumbly pecan set in a syrup so sweet it almost makes your teeth itch, all encased in warm, flakey pastry and served with a dollop of cold vanilla ice cream. 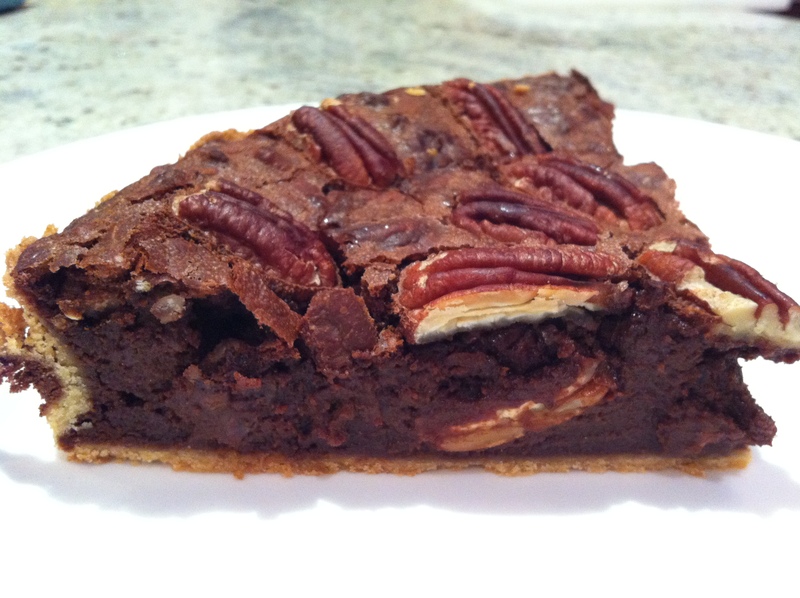 A week later a friend asked me to make dessert for a girly dinner, and my thoughts returned to pecan pie. Flicking through my recipe books, I found the following from my trusty Green & Blacks book. As you may have guessed, it’s got chocolate in. 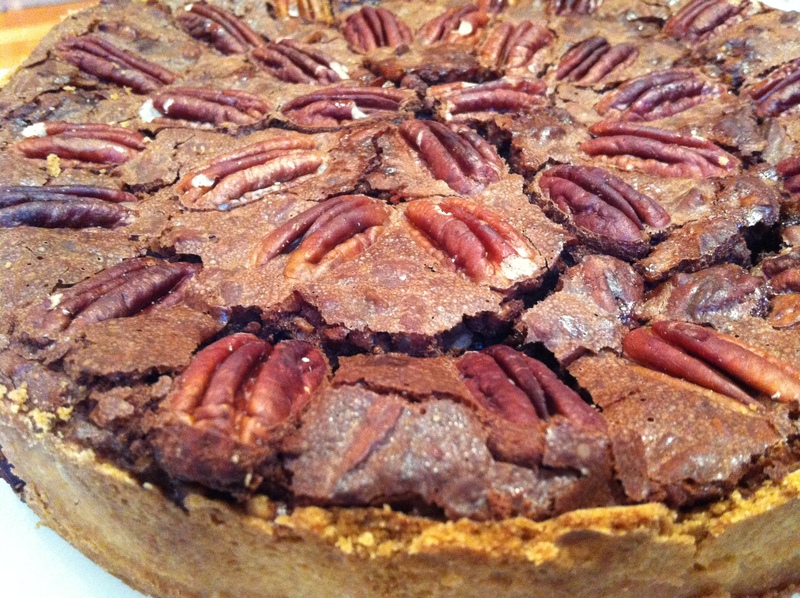 In fact the chocolate plays such a vital part it’s a cross between a pecan pie and a truffle torte. And that’s no bad thing. It’s still sweet, nutty and delicious, but slightly less cloying than a traditional pecan pie, and the ultimate addition to any baker’s repertoire. It’s also really simple to make – the pastry is whizzed up in a blender and the filling mixed in one other bowl. Quick. Delicious. Easy as pie. Delicious, and easy as pie . . .
Sift flour and icing sugar together then blend in a food processor with the butter. Add egg yolks at the end and bind into a pastry. Roll the pastry out thin, about 2mm, then roll round your rolling pin and drop onto a 28cm loose-based tart tin. 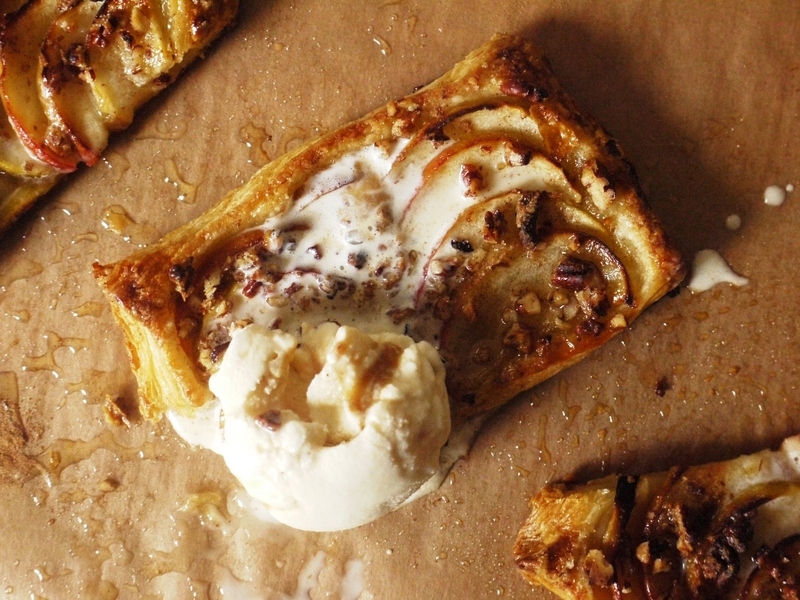 Fill in any gaps with excess pastry and leave a slight edge – the pastry will shrink slightly while cooking. Chill for 30 mins, then fill the case with baking beans, or uncooked rice, and bake for 15 mins at 180 degrees centigrade. Remove the baking beans then cook for 10 more minutes til a pale golden brown. Remove from oven and reduce to 160 degrees centigrade. Melt the chocolate and butter together. 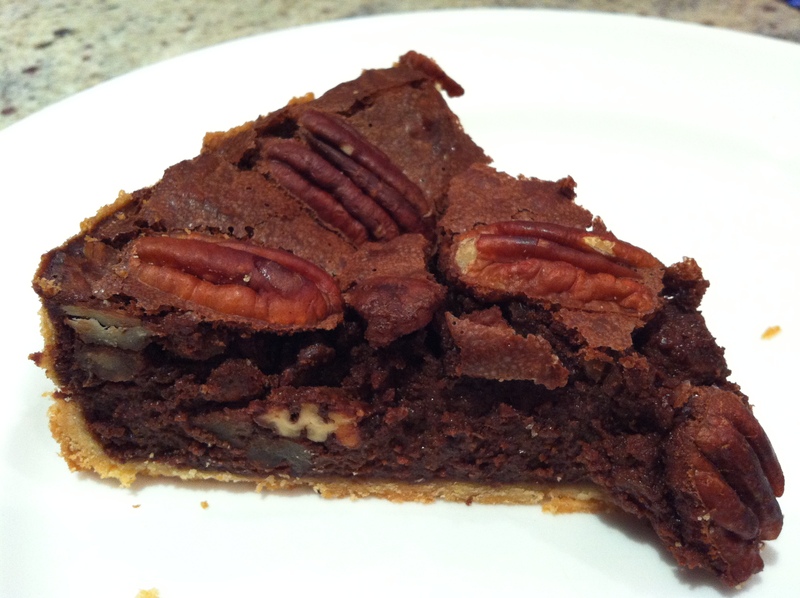 Combine all the other filling ingredients (minus 100g whole pecan nuts), then add the chocolate and butter mixture. 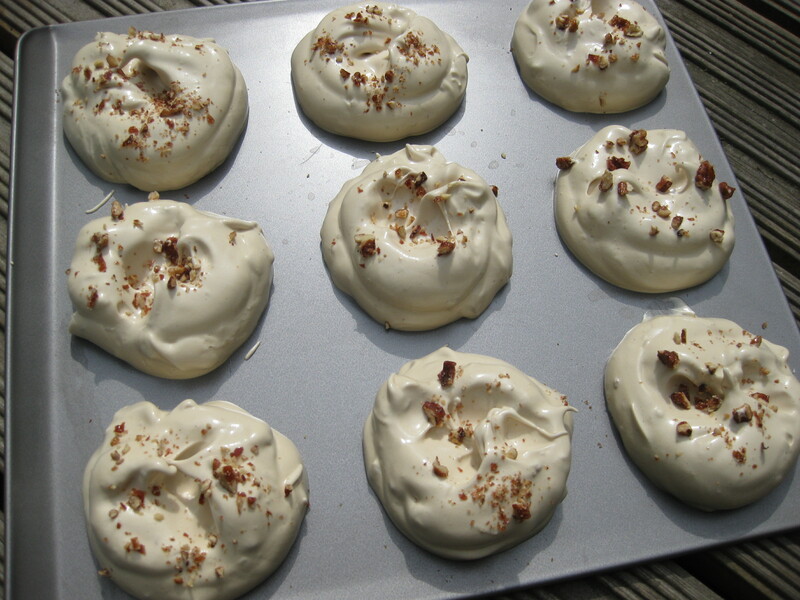 Pour into pastry case and decorate with remaining pecan halves. Cook for an hour, covering with foil towards the end if necessary to present pastry from burning.